Spring is finally here! (At least the calendar says it is.) With the warmer weather hopefully just around the corner, I have been feeling all of the typical spring time urges. The urge to purge, to clean, to organize, and to tackle all of the home improvement projects that I’ve been thinking about all winter! Along with all of those more grown up tasks, I am really looking forward to doing some Spring decorating in our home. One of my favorite ways to change up our decor is to DIY things from items we already have lying around. Enter the Mason Jars! As you already know, Mason Jars are some of the most versatile little items in the universe. They have their obvious purpose for canning and preserving foods, but they can do so much more. I personally have switched all of our dried goods in our pantry to glass Mason Jars, in order to keep things fresh, and to keep the critters out! Every now and again I find new ways to use these adorable jars in our home. From utensil organization by the stove, to homemade air fresheners in the bathrooms and DIY votive candle holders these puppies are just about everywhere in our home. After many hours of Pinterest stalking I have compiled my favorite Spring DIY Mason Jar Crafts here to hopefully inspire you! Many of these are kid friendly, and would also make a GREAT excuse to get the gal pals together for a craft night. Keep reading for my Spring DIY Mason Jar Crafts. These Easter Egg Painted Mason Jars from MasonJarCrafts.com are a fun alternative to traditional Easter Egg decorating. This Mason Jar craft will make less of a mess with little ones, doesn't require hard boiling or blowing out eggs, and leaves you with adorable decor that you can use year after year! Why not make a few extra to give as gifts to family and friends, or even serve as mini Easter baskets for neighbors, teachers, co-workers or friends at your kid's school! Add a little basket file for paper grass, a few pieces of candy, and tie a bow around the neck of the jar and you have a sweet spring DIY gift that is fun and easy to make with kids and adults! If you like the idea of using spring themed Mason Jar crafts as gifts, then check out these Easter Bunny Treat Jars from HappinessIsHomemade.net. This style of painted jar is even simpler to create, and something even the youngest kids can make beautifully! Just add a bunny shaped sticker or vinyl decal on the jar, paint over it, and remove the sticker to leave a cute little window into the jar and the goodies that are inside. Customize these with a little ribbon, some lace detail or daisy jar tops to give it some extra flair. These next two Mason Jar crafts are ones that could be used as decor all season long! The Spring Inspired Striped Jars use light pastel colors and a little distressing to create a country chic take on the springtime mason jar trend. Create a few to sprinkle throughout your home decor, or line up a set of three to make a sweet centerpiece for your Easter table. The Mason Jars Centerpiece from BUtifulDesigns on Etsy, is a lovely take on Spring Time Country Chic. Choose pastel shades that speak to you, in chalk paint for that worn in look, and tie them together with some twine, jute or rope to create a sturdy and classy centerpiece that will leave your guests wondering how you did it! This feature is an Etsy listing, so you can purchase these from the seller directly, or take a little inspiration from them and try this Mason Jar craft out yourself! Find the Etsy listing here. Don't forget about all of the other sizes that Mason Jars come in! Over at ModPodgeRocksBlog.com they show you how to use what looks to be the Wide Mouth Pink 16 oz jars to make a spring inspired rustic planter for some faux succulents. Try adding smaller sized Mason Jar crafts in with standard and larger sizes to create more visual interest in your display! Faux plants are a great option, especially for Mason Jar crafts like these, because they will keep on looking beautiful - even if you forget to water them. Now this final Mason Jar Craft idea may be my favorite, but it's not so much as a tutorial as it is inspiration. The Mother's Day Brunch Ideas post over at DesignImprovised.com walks you through the whole setup from decor to the tables cape and food inspiration. 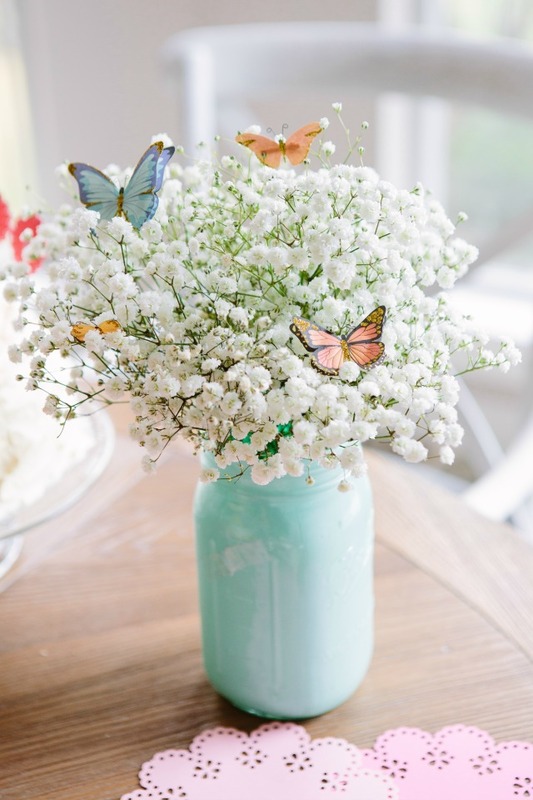 The Butterfly Bouquets are Mason Jars painted on the inside instead of the outside, which leaves the glossy appearance intact, and makes it almost look like the glass itself is colored! The simplicity of the Baby's Breath with the butterfly embellishments ties the whole theme together and brings such the light, feminine, spring theme to life! Check out the full Mother's Day Brunch post here. Do you love all of these Spring DIY Mason Jar Crafts as much as I do? Check out my Pinterest for tons more inspiration for every theme you can imagine. Try starting with the "SEASONS | Spring Has Sprung!" board for more spring time inspiration! I hope you enjoyed this collection of craft inspiration! Make sure to follow me on all of my social media profiles for more inspiration like this.